A "SYNERGY" of Form and Function, these hand-crafted stone tools are the result of years of reseach and hands-on testing to create the most versatile, controllable and customizable massage tools available. A sweeping revolution in design, SYNERGY STONES enable massage practitioners to perform the new HEAT~WAVE Massage as well as enhance any mainstream style of massage such as Swedish, Deep Tissue, Sports, Reflexology, Chair Massage and many more with HEAT~WAVE techniques. There are two versions of each SYNERGY STONE. "Original" SYNERGY STONES have a grippable but smooth surface that can be securely held while using with oil for relaxing and deeper therapeutic techniques. They make giving a Professional HEAT~WAVE hot stone massage, and enhancing other styles of massage easier and more enjoyable with advanced techniques and reduced hand and finger fatigue. "Ultra-Smooth" SYNERGY STONES are the same shapes as "Original" but with a glossy surface over the whole stone and are perfect for massaging over clothes without oil and against skin with oil and gentle soothing pressure. These are excellent for Professionals that practice chair or clothed table massage as well as for Self-Care, Family massage trades, etc. 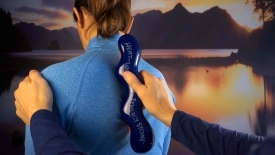 A work of art and massage tool marvel, HEAT~WAVE Synergy Stone is making WAVES around the world! Held with two hands or one, the name of this Patent Pending massage tool says it all. HEAT~WAVE and its five elbow like tips and ends work to penetrate deeply while its two long flat sides provide a surreal soothing warm sensation. HEAT~WAVE is redefining what can be accomplished in a hot stone therapy session. For it's ability to radiate warmth longer than any other Stone Tool available and for being able to perform gentle Soothing effleurage as well as intensely deep yet pleasurable muscle sculpting, HEAT~WAVE means business. A Trifecta of specialized features, the DIVINE Synergy Hot Stone enables you to address reflex zones and trigger points with controlled precision and any degree of gentle to deeper pressure. With 2, 3 and 4 knuckle like tips, DIVINE Stone is able to focus your intention and efforts while giving your thumbs and fingers a needed rest during a stone therapy session. Naturally perfect for massaging anywhere you need more focused pressure DIVINE can be held with one hand easily and securely. Surprisingly fantastic over face and scalp too for an invigorating yet relaxing sensation. Improve circulation, decrease tension and massage away aches and pain with HEAT~WAVE techniques and the DIVINE Synergy Hot Stone. An elegant balance of form and function, SERENE Synergy Hot Stone provides broad warmth with a large flat surface area. With notches on both sides to give maneuverability and agility where needed, SERENE can transform an average massage into a ultra-relaxing and therapeutic masterpiece. And for deeper techniques such as "Rake" and "Sculpt", turn SERENE on edge or end to transform into a muscle sculpting tool of amazing capability. One of the CORE Synergy Stones, SERENE plays a major role in the HEAT~WAVE Massage as well as enhancing other mainstream styles of massage such as Swedish, Deep Tissue and Sports. BLISSFUL Synergy Stone is true "Hot Stone" versatility. With it's Dual-Touch hourglass design and thin middle, gliding over the body's curves and turns, angles and straight-aways are handled with ease. Perform every Heat~Wave technique including Soothe, Circle, Knead, Sculpt, Rake, Rock and Tapote. Held with one hand or two, this hot stone is able to perform warm, gentle and soothing massage as well as deeper muscle sculpting when needed... BLISSFUL Stone skillfully manipulates everything from the neck to the forearm to the low back to the legs and feet. The X-shaped SUBLIME Synergy Stone features 4 T-shaped knobs and 4 soothing saddles that Knead, Sculpt and Rake muscles toward optimal health. This hot stone tool fits so well in your grip it virtually becomes an extension of your own hand. Easily held several different ways which allows for many different approaches to each area you're massaging. Excellent at twisting long muscles to lengthen, spreading wide muscles to broaden and kneading large muscles to soften. A favorite for gentle tapotment as well, SUBLIME'S list of abilities is long and ever growing. SYNERGY STONES blend the deeply relaxing warmth of Hot Stone Massage with the health benefits of Therapeutic bodywork. The receiver experiences a new dimension of relaxation... A Massage unlike any other, and the "SYNERGISTIC" benefits of Soothing Warmth, Custom Pressure and Advanced Massage Techniques. 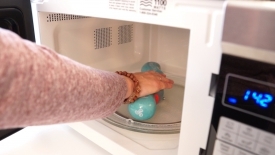 SYNERGY STONES can be heated conveniently in a microwave oven, between a BodyMed heating pad or in hot water. They can also be used at room temperature and even cold for a refreshing and stimulating massage sensation. A "SYNERGY" of Form and Function, these hand-crafted stone tools are the result of years of reseach and hands-on testing by Scott Wynn, LMP of over 20 years, to create the most versatile and heatable massage tools available. A sweeping revolution in design, SYNERGY STONES enable professionals to perform both the new HEAT~WAVE Massage as well as enhance any style of massage such as Swedish, Deep Tissue, Sports, Reflexology, Chair Massage and many more with Synergy Stone HEAT~WAVE techniques. Synergy Stones feel amazing on each other and for self-massage. At the end of the day, destressing is a must. These massage tools give you a convenient and effective way to "iron out the knots" simply and enjoyably. Microwave for 60-90 seconds then take turns sitting behind each other for 5 minutes, massaging between the shoulders and down the back. It's a perfect time to check in with each other or yourself, to ask the simple question of "How was your day? What can I do to make it better?" Regular massage is the goal. Synergy Stones make it possible.